I wish to express my deepest sympathies to the victims and those who grieve because of the consequences of the terrorist attacks in Christchurch, New Zealand. To all my Muslim brothers and sisters in New Zealand, Australia and around the world, I stand in solidarity with you in your horror, grief and distress. I offer my prayers on behalf of the Catholic Diocese of Parramatta to the deceased, the injured and to all the individuals and communities who have been affected by this senseless violence. The attacks on innocent lives at a worshipping place were sadly motivated by hatred and prejudice against people of the Muslim faith. I condemn Islamophobic, racist and extremist violence in all its forms. It is an offence to God, to believers of all faiths, to all people of good will, and to our common humanity. Times like this should make us reflect on the way we treat one another in words and actions. We will reap what we sow. Let us therefore not only eliminate the fruit of prejudice, hatred and violence but also its seeds in their many forms and on many levels of our society. May Muslims and Christians everywhere respond to the joint invitation by Pope Francis and the Grand Imam, Sheikh Ahmed al-Tayeb, to “all persons who have faith in God and faith in human fraternity, to unite and work together so that it may serve as a guide for future generations to advance a culture of mutual respect in the awareness of the great divine grace that makes all human beings brothers and sisters.” (Document on Human Fraternity for World Peace and Living Together, Abu Dhabi, 4 February 2019). In these troubled times, when evil forces seek to divide us on the basis of race, colour, ethnicity or religion, may Muslims, Christians, people of all faiths, and all people of good will remain united in heart and mind and resolve. May faith bind us in human solidarity, hope drive out fear, and love overcome hatred. 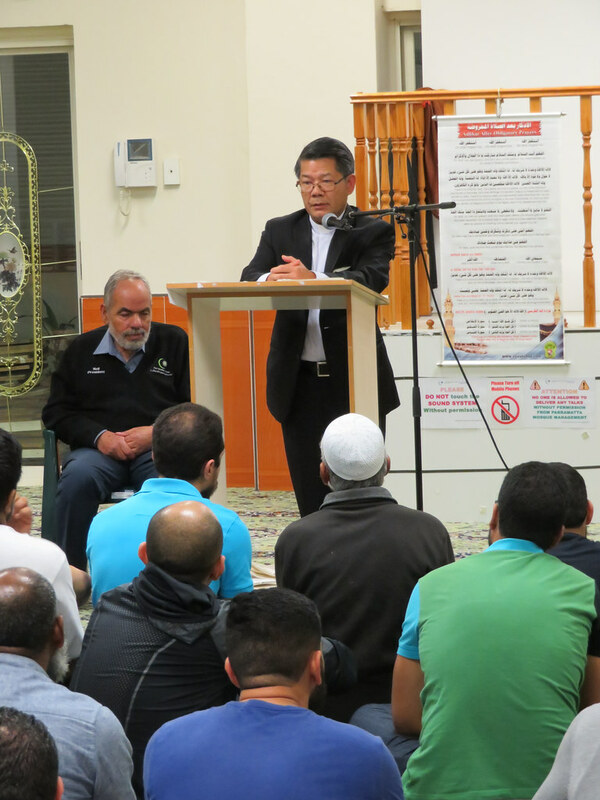 View images from Bishop Vincent’s recent visit to Parramatta Mosque here or below.